The daytime minus tides that began on Thursday are the last of the lowest for 2013, so this week’s a great time to get out and explore. All tides below are for Seattle and can vary depending on where you go in the Salish Sea. 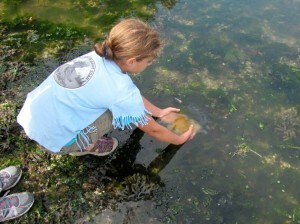 The Kitsap Beach Naturalists will be sharing cool finds at Scenic Beach State Park Saturday (8:30-10:30), Fay Bainbridge Park Sunday (9-11), and at both Kitsap Memorial State Park and Lions Park (Lebo Blvd. in Bremerton) Monday (11-1). Reactions to a dead shiner perch (Cymatogaster aggregata) were varied, particularly as we showed off the evidence of parasites that may have hastened the perch’s demise. Turns out the poor fish’s body was home to a small coven of vampires! Out from under each gill cover poked what looked like a pair of small Slinkys. A colleague who trained as a fish pathologist, informed us that the coils were the gonads of a parasitic female copepod called Haemobaphes diceraus. Copepods are crustaceans, better known as abundant members of the microscopic animal plankton. Of course, in certain circles, their fame derives from Plankton, the tiny, one-eyed nemesis from SpongeBob SquarePants. Plankton was a reasonable depiction of typical copepods, which have teardrop bodies with a single eye and long antennae. 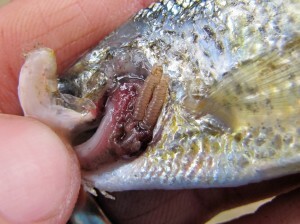 Their parasitic cousins, however, wind up looking more like a bit of offal from the cleaning of the last catch. Haemobaphes diceraus has a long trunk that extends through the gill arch and directly into heart, where… it siphons off blood. It’s super cool creepiness even garnered the honor of Parasite of the Day in 2010. 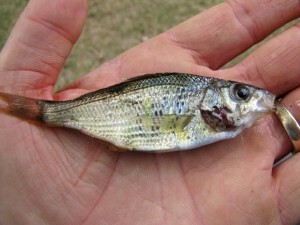 Research from Nanaimo, British Columbia in the early 2000’s found that about 10% of shiner perch unwillingly hosted their personal blood sucker. Interestingly 97.9% of the infested fish they studied had only a single copepod inhabiting them. Our sad specimen sported two. Bummer. Beauty and grace combine on a bed of slime. Imagine shaping yourself to the ground as you move through your daily life. While halfway up the stairs, I’d be thinking “Oh yeah, I’m pretty cool.” (Then again, I’d be choking on dust and dog fur.) Alas we remain upright and rigid, but we can still enjoy watching a flatworm live the glide life. While collecting for the touch tanks, Harbor WildWatch staff found a beautiful giant flatworm (Kaburakia excelsa). Their typical home is under rocks, though you may find them on floats and docks and among masses of mussels. 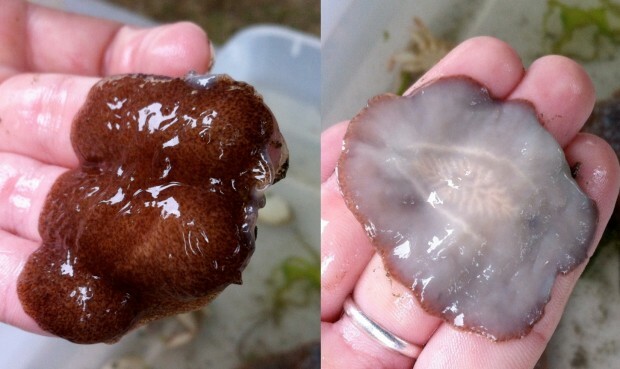 Since they can read 4″ long, these are the giants of the flatworm world and a bit tougher than their smaller cousins. You can see the highly branched digestive sac in the picture of it’s underside. Though branched, the sack is made up of dead ends. After using an eversible throat to capturing an unfortunate victim, partially digested food is moved into the digestive sac. Since there’s no point B for the indigestible bits to leave the sac, poo must go out where the food came in. Yum. Wandering the beach is an iconic part of the Salish Sea summer. Summer’s going fast, so explore a beach this week. Go slow. Be observant. There’s always some new bit of wonder tucked on a rock… or sticking grotesquely out of the side of a dead fish’s head! Terrific Tides and Getting Crab Crazy! Dust off the crab pots (both the one with holes and the one with boiling water), it’s crab season! The long awaited day has arrived (as of 7:00am today, 7/1), and many will feast on freshly caught crabs for the holiday. 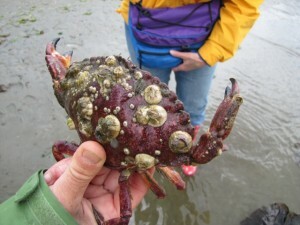 After all, Dungeness crabs are as Northwest’erican as espresso and apple pie. Don’t forget the red rock crab though. It’s tougher to crack, but abundant and mighty tasty. – You can keep up to 11 crabs a day! 6 hard shelled red rock crabs (male or female). 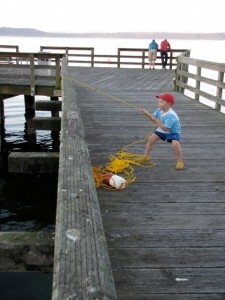 – Use pots (with degradable cords to prevent ghost fishing) or collect by hand. – Priest Point Park, June 2, 12:15pm – 3:15pm. I’m sure there’s more! Please share other opportunities through comments.